This disc Rhapsody of Winds presents music for wind orchestra by three contemporary Estonian composers. 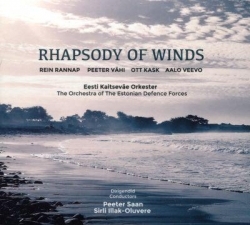 Performed by the Orchestra of the Estonian Defence Forces (Eest Kaitseväe Orkester) conducted by Peeter Saan and Sirli Illak Oluvere, the programme consists of Rein Rannap's Rhapsody of Winds (Tuulte Rapsoodia), Peeter Vähi's Between Heaven and Earth (Maa ja taeva vahel), Ott Kask's The Suite for Wind Orchestra (Süit Puhkpiliorkestrile), Aalo Veevo's Puppeteer (Nukunäitleja) and Rein Rannap's Three Pieces for Winds (Kolm Pala Puhkpiliorkestrile). The disc, which is produced by the Estonian Defence Forces, is an interesting overview of contemporary Estonian wind orchestra music. Rein Rannap's Rhapsody of Winds was written in 2014, it is structured like a series of variations. Opening with quietly intimate music, a fanfare-like section interrupts before the more intimate music continues and develops. Tonal and quite romantic in style, Rannap has a nice ear for variations of style and texture to keep the piece inventive. Peeter Vähi's Between Heaven and Earth was premiered in 2010 in Tartu Town Hall Square with the composer suspended in mid-air playing the bells of the town hall. The disc uses the composer's revised version, with the bells played in the orchestra though I have to confess that experiencing the original version live would be fun. The piece opens with a dark rumbling in the bass of the orchestra, wind machine and bells, alternating with a chorale like theme, and as it develops the work feels like Strauss's Also Sprach Zarathustra re-invented. After the opening section an oriental melody develops (Vähi is interested in Eastern philosophy and music, and a thread of this runs through his music), and is combined with catchy rhythms and striking textures to create something rather engaging. After this climaxes, the bells and chorale return for a brief coda. This is certainly a work worth investigating. Ott Kask's Suite for Wind Orchestra was commissioned as a prize for Wind Orchestra of the Year 2012. The suite consists of three well written and deliberately traditional sounding movements. A lyrical oboe introduces the unashamedly romantic Song, whilst Scherzo uses perky winds in a chattering tune brightened with xylophone over a rhythmic texture. Finally The Hymn is quietly lyrical. Aalo Veevo's Puppeteer is a nine-movement suite written in 2011 and the piece won 3rd prize in the 20th Annual Chiayi City International Band Festival in Taiwan. The piece is programmatic, presenting the life of a professional puppeteer. The result is a highly characterful sequence of movements, with a clear narrative feel. Veevo writes in an attractively lively style with some jazz and popular hints, creating a varied sequence with some colourful orchestration. Finally the disc returns to the music of Rein Rannap for his Three Pieces for Winds, the first lyrical with a nice clarity of texture , the second quietly rhythmic and the third dramatic and up-tempo. All three have hints of more popular music in their textures. This disc is not the easiest of discs to get hold of, but the Estonian Music Information Centre's website has links to on-line record stores. If you are interested in contemporary music for wind orchestra, particular with more popular hints then it is worth seeking out and the performances from the Orchestra of Estonian Defence Forces are excellent.